Why writing to the theater? Oh, I often ask myself why there is no better place I rather be. On one hand this is the only place on earth I can meet characters I’ve created. Not only meet, I can even talk to them and get know them better. Aliveness of the theater is what I like almost. On the other hand when I was at school I was always divided into two parts – I was excellent in math but I was dreaming about writing and literature. When I grew up I realized there is a place where I can join those two – a work of drama writer – profession that combines both structures and poetry of words. It gave me then and still gives me the joy of being reunion. That is why I’m here. See below all the activities involving Elżbieta Chowaniec in the frame of Fabulamundi. Elżbieta Chowaniec was born in 1982 in Kraków. She is a playwright and dramatist, author of plays for adults and children. She is a graduate of Katowice Film School with a degree in Film & TV Production, Łódź Film School with a diploma in Screenwriting, and Warsaw University with a Journalism degree. She attended the School of Drama at the Drama Laboratory in Warsaw. She has participated in numerous playwriting seminars and workshops with authors like Mark Ravenhill, Nikolaj Kolada, Iwan Wyrypajew. She is a recipient of the Theater Scholar Award from the Ministry of Culture and National Heritage. Her first work, Gardenia, was staged in 2007 at the Drama Laboratory, Warsaw. Since then it has been translated into numerous languages and staged in Hungary, Slovakia, Russia and Romania. Since her debut in 2007, her plays and their adaptations have premiered over 20 times. She has been collaborating with the Czech director, Marek Zakostelecky, to create original plays and adaptations for children since 2013. Other director’s she has collaborated with include: Aldona Figura, Joanna Grabowiecka, Daria Kopiec, Wojciech Urbański, Robert Drobniuch, Jiri Havelka. 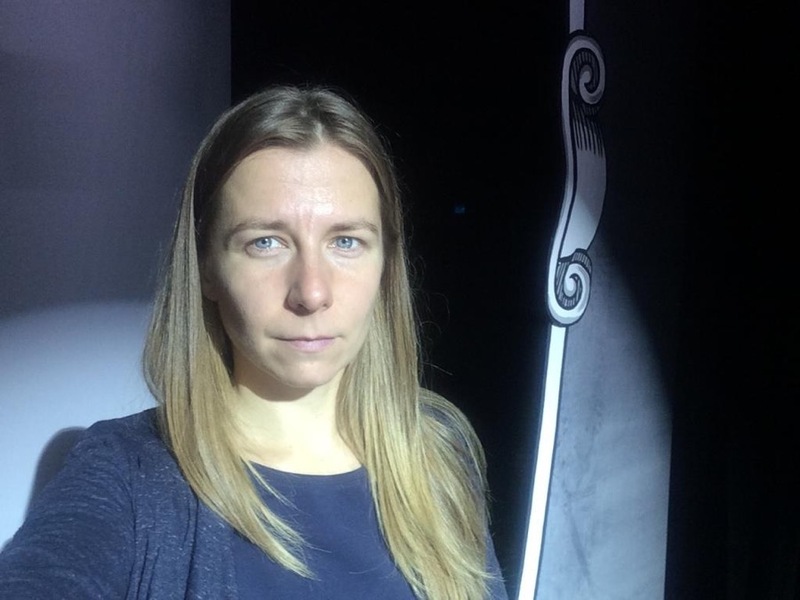 Theater’s she has worked with include: Teatr na Woli (Warsaw), Laboratorium Dramatu (Warsaw), Teatr im. Juliusza Słowackiego (Kraków), Teatr Powszechny (Radom), Wrocławski Teatr Lalek (Wrocław), Teatr Lalki i Aktora (Kielce), Teatr Lalka (Warsaw) and Polish Radio Theater. Form in dramaturgy is one of her passions, especially as it relates to dance theatre and puppetry. She works with dancers at Pracownia Fizyczna, Łódź; she teaches dramaturgy of dance in the Choreography Department of the Music Academy, Łódź; she also teaches dramaturgy of form. ‘Gardenia’ is a feminine tragicomic story about four generations of Polish women from the same family who are fighting with their schemas, convictions and heritage. All the women present to be the same age – great grandmother, grandmother, mother and daughter – as thirty three years old, an age that is pivotal to establishing who you really are. It appears as a relay race with a baggage of problems, addictions, burdens and experiences. The great grandmother tells her war story. The grandmother has a story form the communist regime. The mother had to live during martial law. The daughter is a child of a free country and the present. This is how ‘Gardenia’ gets through the country’s political circumstances as well as the women’s own private stories. The irony is such that historic circumstances shapes women’s life but do not implicitly decide about it’s direction. Precisely, what decides? My mother – they would say. The grandmother finds the cause of her suffering in her mother’s poor choices. The mother recognizes that the case of her own unhappiness lies in her mother’s outlook on life. However, daughter sees it and doesn’t want to claim to her mother. She is aware of these connections, complicated interdependencies and the whole network of circumstances, choices, struggles of her family. Is it enough to break through it? ‘Gardenia’ doesn’t give the clear answer but surly it forces life’s main questions. ‘Lady with an Ermine’ is a story based on Simona Kossak’s life who was great granddaughter, granddaughter and daughter of very famous painters but it the least, did not inherit any paining talent. What she did was work and fight for animals right and nature in largest National Park in Poland – Puszcza Białowieska. She moved away from urban Cracow into the depths of Puszcza Białowiska and lived there for more than half of her life in a very small cottage with no electricity. She was very controversial – she loved art as much as Mother Nature – she had the copy of Lady with an Ermine in the room and real wild board in her own bed. The play tells a story about most important objects in Simona’s life such as her relationships with mother and father, her way to becoming an adult, her attitude to animals and last but not least – her relationship with a men. Besides Simona herself the story is also narrated by animalistic storytellers: female dog, raven, roe-deer and wild board. This wild perspective creates very different but surprisingly well know image of human being. What’ s more the play touches upon questions about family’ structure and inherited familial convictions. It tells us, that you are able to develop your potential, be free and live in complete wasteland and it still doesn’t alter the fact that you will remain central to your famous family portrait.